A FREE copy of the Everyone Can Play resource (worth £40) with class materials all ready for classroom use straight away. Everyone Can Play is designed to engage all teachers in making music with their classes whether they consider themselves to be musicians, music specialists, musical or not and will enable children to develop musical skills, build confidence and support their overall personal development. Engage students in whole class music making by providing a simple step by step resource, suitable for beginners, that supports the development of instrumental skills on the ukulele using practical activities which cover strum patterns, chord shapes and easy chord progressions. Understand how to deliver outstanding lessons that are rooted in active music making. Explore ways to ensure that students are fully engaged in lessons. Develop confidence in promoting and identifying outstanding progress in music learning. Develop classroom approaches that provide a catalyst to involve all students, including disadvantaged groups in extra-curricular music making. Build essential performance skills amongst students that will promote achievement and attainment in music. See how the approach can work with students. Primary general classroom teachers – who don’t consider themselves to be music specialists. 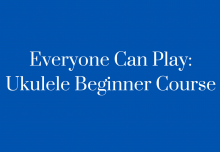 Everything is included to enable you to teach ukulele having never played before!